WANTED: Driven, motivated, hard-working athletes who want to lessen the learning curve and excel in sport and life. Do you have questions about: where to get started, what your next steps could be, realistic goal setting, or how to get the most out of your training? What about your pre-race plan, warmups, data analysis or how to balance it all? I focus on the whole athlete to set you up for success. It takes a village. And I'm really good at focusing on the details. Jennifer Sharp, a USA Cycling Level 1 and TrainingPeaks certified coach, has a knack for bringing the best out of athletes. Her experience as an elite level track racer and masters national champion as well as tandem pilot in the Para-cycling road and track world championships gives her the experience and knowledge of what it takes to be successful at the highest level. 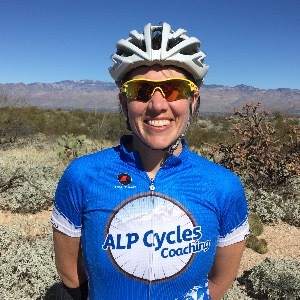 Her coaching philosophy is based on figuring out each client’s individual balance point between working, living and cycling in order to help them become the best athlete they can be. A lifelong athlete and competitor, she strives to bring the knowledge and wisdom she’s gained in sport to those she works with. Jennifer specializes in hands on skill sessions, mental skills training, nutrition consultations, goal setting, and road and track tactics. She is passionate and enjoys sharing her wisdom with others. Committed, hard working, open to learning and coachable. Success. Coach Jennifer Sharp has been notified of your message.